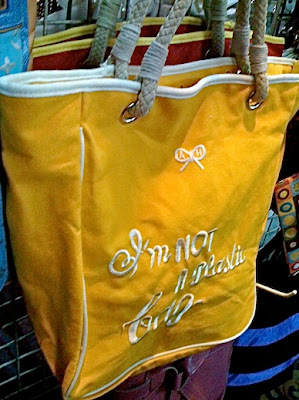 when we first saw the picture above of fake anya hindmarch's "i'm not a plastic bag" bags in daphne's flickr, we were shocked but had to laugh. it's appalling yet amusing at the same time. as she posted, "the real ones didn't even come in these colours." well, today we saw it for ourselves when we went to the karl edward bazaar at NBC tent. the going price for these counterfeit items was P800-P1,000. but the ones below were the cheapest that we found for only P400! yellow with white trim and red with yellow trim with embroidered words (tama ba yon?) AND take note may zipper pa! tama ba yon?? of course we who know better will not even consider buying these fakes because we know what it means (supporting terrorism, children working in sweat shops, stealing intellectual property, etc), but the sad thing is that people who DO know better will not hesitate to buy a fake because they think it's bucking the system. going against the establishment. one-upping designer houses that charge their customers thousands of dollars for a damn handbag. well, all it is is aiding and abetting a criminal. but the even sadder thing is that people who DON'T know any better will not hesitate to buy the bag either. 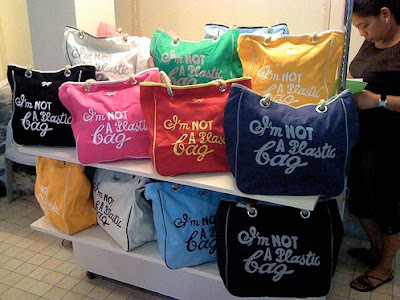 people who don't care who the hell anya hindmarch is, people who don't know what this whole plastic-bag business is. people who just need a roomy tote to lug stuff in. or what about clueless folk who will believe the tindera when she says that the bags are overruns (that's what one told me) or samples (and we can't tell you how many times we've been suckered into believing THAT). and the saddest thing of all is that fake goods (and not just designer bags) are not going away any time soon. it's a trillion-dollar industry that's making some people veeerryy rich. it seems like a losing war. don't support it. I agree with Bobbie Brownie. IF it was about skipping the plasic bag for the green cause, then get na lang the Healthy Options cotton/cheesecloth bag for P50. Large and roomy, and great value. But if you're getting the Anya bag because it's cute, well… then by all means, pay the cute price for it. PS. This is the third I'm posting this comment. Blogspot is kinda wonky. Or maybe my computer is. Sowi. The Anya bag is cute and well we have to respect the original designers of these bags. Its totally like buying fake dvd's. gosh i'm seeing production staff from my network using the fake anyas. i just don't know what they're thinking. i used to lug my authentic anya tote as a secondary bag - for shopping. now i've put it away. i just use these bags from www.envirosax.com and my rustan's shopwise canvas totes for groceries. They gave away these fake bags at Boy & Kris show this week. I don't understand why people are buying fake versions of the Anya Hindmarch bags for 800-1000 pesos when the original only cost £5 here in the UK! 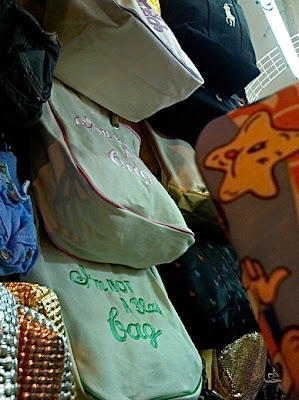 It's a shopper bag, for goodness' sake. Personally, I prefer this bayong from naturalcollection.com. It's huge and I can put my shopping and my baby's toys in there whenever she and I go out.